If I'm at the National Portrait Gallery for events in the morning and afternoon I try and have lunch in the Portrait Restaurant at the top of the building. It has a fabulous view which I never get bored of and the food's not bad either (you can review the menus online - see links below) although not cheap! 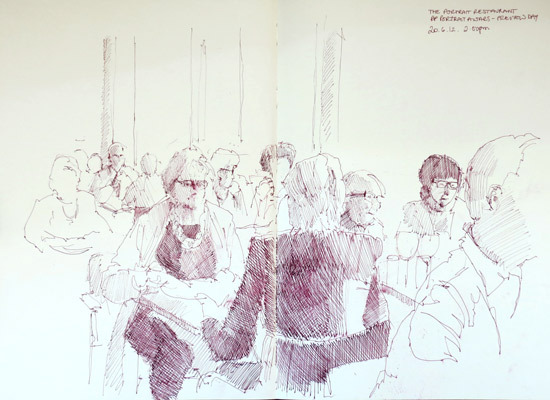 I was making notes of the interviews I'd just done the award-winning artists and about the portraits I'd just seen in the BP Portrait Exhibition so on this occasions did not sketch lunch! Video of BP Portrait Award Exhibition 2012 - a walk around the exhibition with a handheld camcorder. A Profile of Aleah Chapin - includes a link to my video film of edited highlights from my interview with Aleah. 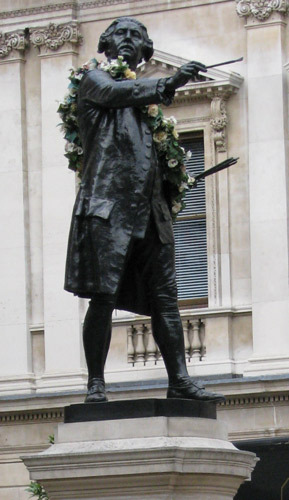 Sir Joshua Reynolds gets a garland - again! 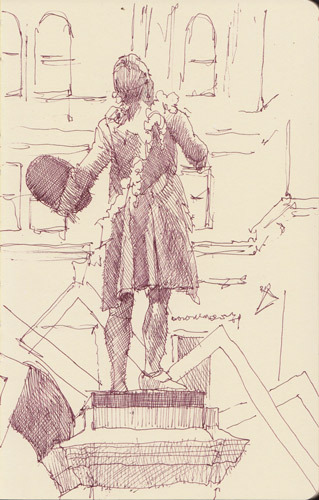 When the Summer Exhibition is open at the Royal Academy of Arts, the statue of Sir Joshua Reynolds which stands in the courtyard of Burlington House is adorned with a garland. Sir Joshua Reynolds (1723 - 1792) was one of the founders of the Royal Academy of Arts and its first President. Garlands were apparently a feature of many of his portraits and I guess there's probably a connection. He's also holding a palette and brush in his hand. You can see his works of art in the RA's permanent collection. This is what he looked like from the other side two years ago when I took a photo of him. I was sat looking out at him under the very nice tent which is erected at the front of Burlington House so people visiting the exhibitions can drink tea - as I was - and not get wet in the summer showers. Or even enjoy some shade should the sun ever come out! You can read my review of this year's Summer Exhibition over on Making A Mark - see Review: 244th Summer Exhibition at the Royal Academy. I went to see Rosie Sanders's new exhibition "Against the Light" of her very large watercolour paintings of flowers art at the Jonathan Cooper Park Walk Gallery today (see Review: Rosie Sanders "Against the Light" to see what I saw). Afterwards I debated a cup of tea versus standing in the rain for the bus - and the tea won. However walking into the Gail's Artisan Bakery at 341 Fulham Road, Chelsea which I'd spotted on my way to the Gallery meant I had to view the goods on display. From there it was a mere short delay before I'd ordered my very late lunch (aka afternoon tea) of a plain croissant and a raspberry cupcake and a Pot of Earl Grey. 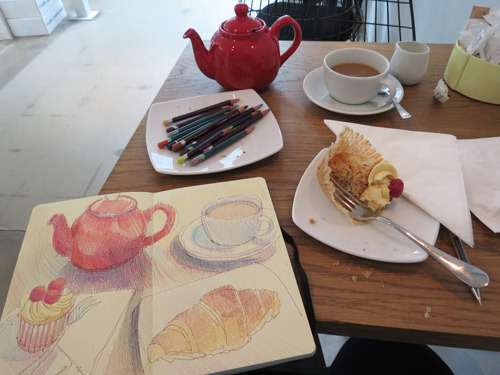 So with my still life ready and waiting I got stuck into sketching. 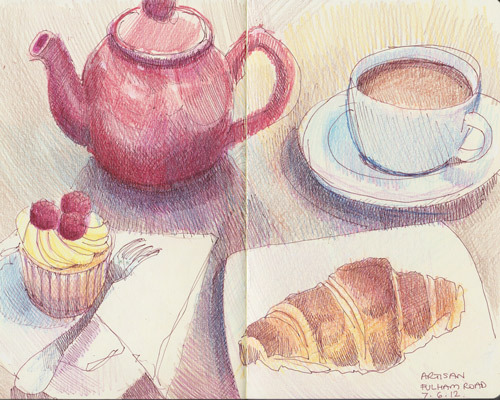 My incentive was that I couldn't eat the raspberry cupcake until I'd virtually finished the sketch! You can see the WIP photo below! We went to look at the Avenue of Sail on Saturday afternoon. I suspected that most of the sailing ships would be in their berths for the Thames Diamond Jubilee Pageant by late Saterday afternoon - and I was right. That meant I was able to see them all properly without the crowds which would be present on Sunday. It was a windy day but we had a bright day with sunshine - so, given the torrential rain on Sunday afternoon, this was by far the better day to view the Thames and its sailing ships. The sketch however presented something of a problem. First off, the tide was going out and it was very low tide when we got there so the boats were all sitting low in the water which created a few problems re finding a place to sit to sketch and then having a subject to sketch. In the end I opted for the top half of the Thames Sailing Barges which were berthed outside the Old Billingsgate Market - as seen against The Shard, the tallest building in Western Europe. I'd been sketching for a few minutes when I realised that the picture in front of me had completely changed. Which was the point at which I realised that the two barges were moving backwards and forwards completely independently. I sketched on - and then realised they seemed to be getting a bit lower in the water too as the tide went out. 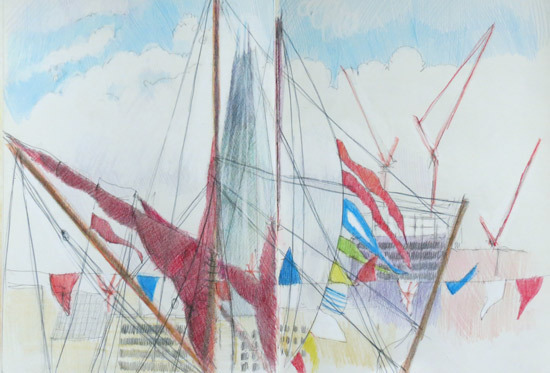 Next time I looked up the bunting had suddenly appeared while I'd been colouring the sails on the barges. I did a quick sketch of the bunting and then decided to call it a day and to go home! You can see my Avenue of Sail photos on Flickr.